Acclaimed literary essayist T Kira Madden's raw and redemptive debut memoir is about coming of age and reckoning with desire as a queer, biracial teenager amidst the fierce contradictions of Boca Raton, Florida, a place where she found cult-like privilege, shocking racial disparities, rampant white-collar crime, and powerfully destructive standards of beauty hiding in plain sight. As a child, Madden lived a life of extravagance, from her exclusive private school to her equestrian trophies and designer shoe-brand name. But under the surface was a wild instability. The only child of parents continually battling drug and alcohol addictions, Madden confronted her environment alone. Facing a culture of assault and objectification, she found lifelines in the desperately loving friendships of fatherless girls. With unflinching honesty and lyrical prose, spanning from 1960s Hawai'i to the present-day struggle of a young woman mourning the loss of a father while unearthing truths that reframe her reality, Long Live the Tribe of Fatherless Girls is equal parts eulogy and love letter. It's a story about trauma and forgiveness, about families of blood and affinity, both lost and found, unmade and rebuilt, crooked and beautiful. T Kira Madden is an APIA writer, photographer, and amateur magician. She is the founding editor-in-chief of No Tokens, and facilitates writing workshops for homeless and formerly incarcerated individuals. A 2017 NYSCA/NYFA Artist Fellow in nonfiction literature, she has received fellowships from The MacDowell Colony, Hedgebrook, Tin House, DISQUIET, Summer Literary Seminars, and Yaddo, where she was selected for the 2017 Linda Collins Endowed Residency Award. She lives in New York City and teaches at Sarah Lawrence College. "Gripping and gloriously written . . . Long Live the Tribe of Fatherless Girls, a memoir from the literary essayist T Kira Madden, is a searing, vivid, and deeply thoughtful take on growing up in a turbulent family in Boca Raton, Florida" - Elle, "Best Books of Spring"
"Madden, ‘a writer, photographer, and amateur magician,’ pulls a rabbit out of her hat and turns her life into art in this gorgeous reckoning" - Washington Post, "Best Books of the Month"
"Madden brings her sharply funny voice to her new book, which humanely explores her coming of age as a biracial queer teenager in Boca Raton, Florida, and the climate of abuse and addiction that surrounded her." - Entertainment Weekly, "Most Anticipated Books of 2019"
"Harrowing and sad and funny and beautifully written. [Long Live the Tribe of Fatherless Girls] inspires rage and also care. I keep stopping to admire sentences, word choices, deft slips in time." - Emily Temple, Lit Hub, "Lit Hub Recommends"
"A Gorgeously written debut . . . Exquisitely captures the pain of growing up . . . Read if you’re into: memoirs, family stories . . . actually I don’t care what you’re into you should read this" - Alma, "Favorite Books for Spring 2019"
"A tale of an artist’s journey that showcases the coexistence of familial love and complication with such shattering grace, understatement, and openness" - Booklist (starred review), “Best New Books"
"A memoir this fearless is bound to change readers' lives . . . In a series of emotionally honest and incisive essays, Madden describes what it took to survive this journey ‘out.’ She turns her strange childhood into a page turner" - Refinery 29, "Best Books of March"
"T Kira Madden’s memoir pairs gorgeous writing with honest emotion, exploring identity and family in her must-read book." 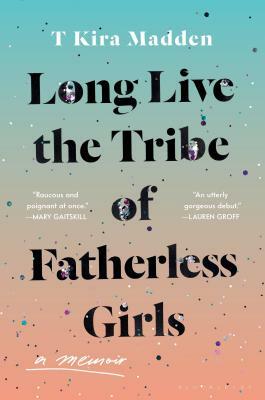 - Paste, "10 Best Books of March"
"Long Live the Tribe of Fatherless Girls is a journey in lyrical bursts through Madden’s youth, adolescence, and adulthood . . . Her prose is as graceful and rhapsodic as it is heart-wrenching." - them.